Once the stopover for ancient nomadic Bedouins, Jordan is now enthralling a new generation of adventure travellers. Follow in the footsteps of Roman Emperor Hadrian, the Prophet Moses, and Lawrence of Arabia and explore the majestic ruins of bygone civilizations, the uber-salty Dead Sea, and the bare sands of Wadi Rum. Mountain biking on former caravan routes offers a local perspective, getting you up close and personal to the shepherds and perhaps even to a camel or two. From vibrant and urban Amman, flanked by ancient citadels and Roman ampitheatres, we explore this oasis of the Middle East from north to south. When possible we transfer high and bike down, including a descent to the lowest place on earth, the Dead Sea. Float and cover yourself in mud before heading up to Mount Nebo, where Moses looked across at the Promised Land, from which we descend to the edge of the Dana Nature Reserve, a bird watcher's paradise. Dirt trails take us along a ridge and eventually above Petra, though the city itself is purposefully difficult to see and will be discovered the next day on foot. Trade ancient civilizations for the stark desert of Wadi Rum, also known as the valley of the moon. We re-hydrate at the Red Sea, our last stop in southern Jordan. Jordan will be unveiled to you in a myriad of layers, from ancient ruins, vibrant culture, unique overnights to exquisite cuisine and all while biking the length of the country. After arriving in Jordan, we meet at the hotel and go over the trip during our welcome dinner. First, we visit the ancient citadel and the Roman amphitheatre. Then, it's an easy ride to start, then we go on dirt track with a long descent to the Zarqa River, which we cross and transfer to the Dead Sea for a float. A visit to Mount Nebo and Madaba before our ride. The routes are on the quiet roads with rocky brown and lush green mountains on dirt trails, rocky paths, and gravel roads. Today sees more climbing than others. A visit to Shobak Castle, the first Crusader castle in Jordan, then on the saddle for an adventurous ride: dirt trails, higher elevations, and awesome views. We finish at the en-trance of Petra. It's a full day to discover the stunning wonders of Petra. In the morning, we tour Petra by walking, and after lunch, it's free exploration on your own to visit some other hidden spots. Going further down to our destination in Wadi Rum, or the Valley of the Moon, takes us for a riding experience through desert landscape on car-avan tracks. In the evening, there’s a sunset jeep tour for a beautiful night time in the desert. 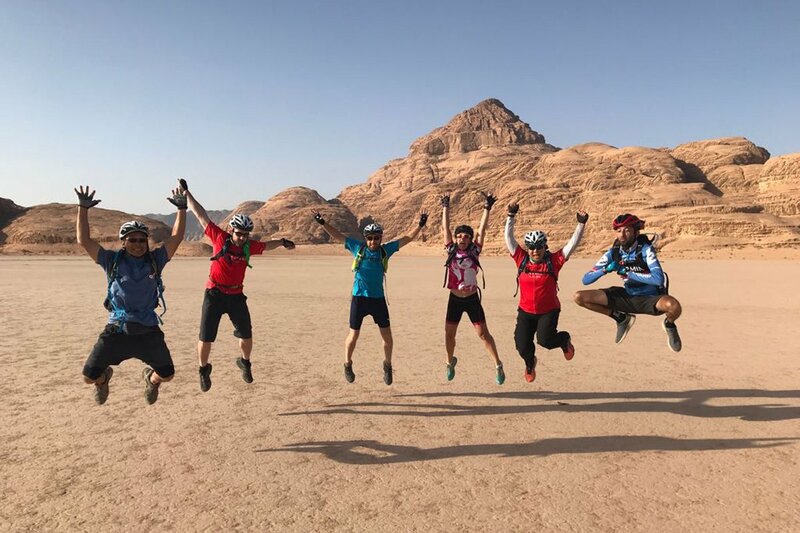 A morning cycle on the desert salt flats around Wadi Rum leads to a mid-morning transfer to Aqaba, Jordan's window to the sea, to enjoy a boat ride before our farewell dinner at the hotel. After breakfast, a group drop-off at the airport in Amman. Please schedule your flight accordingly, or extend your stay in Aqaba - this city is ideal for diving or snor-kelling the Red Sea. Day 2 - Amman - Dead Sea Ride 19km. +253m / -908m. The Jordan team were outstanding! My Son and I had a fantastic ride in Jordan with the SpiceRoads Crew. Wow, what an experience, the perfect way to be a tourist in an amazing country. I also took my own bike and the crew did a great job of looking after it like it was one of their own, however my sons bike was perfect for the ride. The trip was a truly memorable experience. All of us had a great time. It was genuinely an amazing time. Can't believe we experienced so much! The tour leader and cycling team looked after us extremely well. We all enjoyed each others' company as we were tested to our physical and mental limits! I have to say it again, a fabulous trip! We ride 192 km, about 80% off road, in 5 cycling days. The trails are single track to gentler dirt roads. We will be riding through valleys, alongside and into streams, and there will be some climbing. Please note that the daily ascents and descents listed in the itinerary. There are a few sections with limited vehicle support on this tour due to the remoteness of the trails. In case of an emergency, we will be able to call for assistance. Please bring a camelbak or similar hydration system for water and to carry snacks. Your guide’s expert knowledge of the area and terrain means that you always know what is coming up in terms of distance and difficulty. Suitability: You should be confident of your physical condition and bike handling skills. Some climbs are challenging, and so you should have a good level of fitness to cope with more than 1,000 m of climbing on Day 4. As mountain biking surfaces require competent bike handling skills, it is advisable to have off-road, and preferably some single-track experience, although difficult obstacles can always be avoided. Suitable for cyclists with a keen attitude and adventurous nature! Biking Conditions: This tour follows a mixture of dirt trails, rocky surface, gravel paths, off-road biking as well as tarmac. The daily distances aren't long, between 20-54 km in a day, but we will be stopping to see sites along the way and be challenged by the ascents and descents. Welcome to the Kingdom of Jordan! We meet at the hotel for a welcome dinner and go over the details of our upcoming adventure. After breakfast, we see the highlights of the city and visit the ancient citadel and the Roman amphitheatre, a 3,000-year-old piece of history built into one of the many hills in downtown Amman. Time to see more of Jordan, so we transfer north to our cycling start point at 625 m. We have an easy start on a ridge, giving you a chance to get used to the bike. A gradual 2 km climb will be a good test of your gears. Then, enjoy the dirt track as you start the long descent to the Zarqa River. In biblical times, the river was known as the Jabbok River, where Jacob wrestled with God. The beautiful long descent caps off one of the best sections of the Jordan Bike Trail. After crossing the river, we hop in our vehicles for a transfer to the Dead Sea. We arrive early in the afternoon, so you can enjoy a float in the salty waters at the lowest point on earth, 410 m below sea level. As we are starting below sea level, we have a 1,000-m transfer up the mountainside to the plateau for a visit to Mount Nebo, where Moses looked across at the Promised Land before he died. We continue to the Christian town of Madaba to see the mosaic map of the Holy Land, before we reach our start point. We cycle south on quiet roads across the plains of the Madaba Plateau and through the village of Ma’in. The route then starts a long descent following Wadi Zarqa Ma’in on smooth roads passing the Zarqa Ma’in Dam and continues following the river. This portion of the trail is another scenic highlight with rocky brown mountains on one side and lush green mountains on the other. The terrain includes road, dirt track, rocky paths, and gravel roads. We overnight on the edge of the Dana Biosphere, Jordan’s largest nature reserve and home to a great variety of wildlife. Our hotel is in Dana Village, occupied since about 4,000 BC. Today, Dana is inhabited mostly by clans of the Al Ata’ata, who settled in the area during the Ottoman period, about four hundred years ago, and built the present village. The crumbling village was nearly abandoned, but now 70 of the traditional stone houses have been restored, enabling some families to remain in the village. This morning, we drive a short distance to visit Shobak Castle. The first of the Crusader Castles built in Jordan, it was constructed by Baldwin I in 1115 and surrendered in 1189 to the Great Salahdin. We will have more climbing today than any other day, and we start with an incline on a paved road, curling around the castle, until we reach the top of the hill. Here, we hit a dirt trail and begin a stunning section, traversing the side of the mountain, overlooking the mountains of Ras Al-Feid, Mount Safaha, and Gbour Wahdat. The jeep width dirt track crosses dry streams and then climbs to a higher elevation giving us our first glimpse of Petra, Wadi Musa, and the small town of Um Sayhoun, with Aaron’s Shrine barely visible in the distance on top of Jebel Haroun. Finish with a slightly technical descent to the entrance of Petra. Then we take a tarmac road to the entrance of Little Petra. We walk through and clamber up to a dining room with 2,000-year-old frescoes recently discovered in 2010. It is a short cycle from here to our Bedouin camp for the night. We are in tents with cots and shared facilities. A highlight of any trip to Jordan is to see first-hand the archaeological wonders of Petra. Famous for its rock-cut architecture and water conduit system, the Rose City is not to be missed. After breakfast at camp, we drive to the modern visitors’ centre and start our walk to the narrow and famous entrance to the Treasury. Then, you enter the Siq, exploring the ancient rock carved ruins of Facades Street, the theatre, and the court. After lunch, you explore on your own to discover some of the less visited monuments, such as the monastery, the Khubtha Mountain, and the High Place of sacrifice. A long, gradual downhill takes us through quintessential Middle-Eastern desert landscape on caravan tracks. We transfer uphill to the small town of Rajif where we get on our bikes for the desert descent. After a short section on the King’s Highway, the fun begins with a downhill dirt track through pure countryside. On reaching the desert highway, we transfer to Wadi Rum, also known as the Valley of the Moon. Cut into sandstone and granite rock, it is Jordan's largest Wadi. Scenes of Wadi Rum in “Lawrence of Arabia” kick-started Jordan's tourism industry, but you may also recognize it from “Red Planet” and “The Martian”. We go for a sunset jeep tour to experience a beautiful night under the stars in the desert. A morning cycle on the desert salt flats around Wadi Rum will give you yet another perspective on this stark and harsh landscape. Mid-morning, we transfer to Aqaba, Jordan's window to the sea, to enjoy and relax on a well-deserved boat ride on the Red Sea. We have a leisurely lunch onboard and ample opportunity to see the vibrant coral while snorkelling. Meet up for our farewell dinner at the hotel and the last night of the tour. After breakfast at the hotel, there will be one group drop off at Queen Alia International Airport at approximately 11:30 am. Please schedule your return flight accordingly. If you wish to extend your stay in Jordan, Aqaba is the perfect place to dive or snorkel the Red Sea, and the city also borders Israel and is a popular place to cross. Because some people can't imagine going on a trip without their own beloved bicycle, we do not provide them as part of this tour. However, you can hire bikes locally for the price listed in the tour pricing section. The bikes are Scott Aspect mountain bikes with lightweight alloy frames, 30-speed Shimano gearing, disc brakes, and front suspension. If you bring your own bike, please make sure it is a mountain bike, preferably with front suspension, and that it is in good mechanical order. Up to 120 countries are eligible for a visa on arrival. This includes the US, UK, Australia and the majority of European nations. The fee is JOD 40 for a maximum of 2 months and a single entry. There is a JOD 15 exit tax from Jordan at land borders. The optimal months to visit Jordan is March – May, and Sept- Nov when the temperature is comfortably warm, not scorching. The heat will hit in summer from June – September, when temperatures can rise up to 40 C, and lots of water and sun cream is a must! However, it's dry heat rather than humid. December – February is winter time; snow and rain can be found throughout the country along with short days and freezing nights. It is also regarded as a quiet time for visiting. Meals are included as per the itinerary where B = breakfast, L = lunch, D = dinner. Middle Eastern cuisine is a highlight of this tour in both Israel and Jordan. Popular everyday snacks include hummus, falafel, baba ghanioush, tabbouleh, olives and pita bread. Israel continues to adapt, elements of various styles, but also incorporating local agricultural products such as avocado. As Jordan is one of the largest producers of olives in the world, olive oil is the main cooking oil. Jordanian cuisine ranges from baking, sauteeing and grilling of meats to stuffing of vegetables – leaves and eggplants. Also common is roasting or preparing foods with special sauces. In Southern Jordan a specialty and delicacy of the area that you will get to enjoy is the Zarbs, which is prepared in a submerged oven called a taboon. Keeping you completely hydrated is a job we take very seriously, especially in a desert environment. Cold water, some energy-restoring soft drinks are included in the tour price while riding. Soft drinks and other beverages during meals are not included. But you may also want to bring electrolyte in powder or tablet form. Alcoholic drinks are available in Israel everywhere but only in hotels in Jordan. Alcohol is NOT included in the tour price. The Jordanian Dinar (JOD) is the currency of Jordan. ATMs are available in Amman and Aqaba. The use of credit cards; American Express, Visa, Master Card, Diners club are accepted at some hotels, however, it is recommended to have some cash at hand.